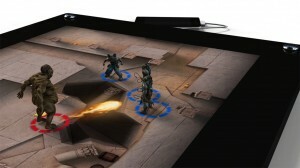 Gamespot reports that the large touchscreen device will retail for approximately $400. Gamespot also declares that the unit is a touchscreen, though I haven’t see anything directly from ePawn that says it responds to touch (but it would make sense). What ePawn does claim is that it can track 100 objects simultaneously that have been configured (possibly using fiducials) to work with ePawn. In fact, it can track orientation and altitude (how high above the screen) of an object. Another interesting specification is the ePawn does not come with an embedded CPU or memory. It works in tandem with a smartphone, tablet, or computer. So game designers can work with platforms they already know (their SDK supports Windows, Android, and iOS). While I’m not exactly thrilled when the acronym DRM is said in the context of positive features, the ePawn provides a seamless DRM in the tracking technology. Which means game providers can limit their game to only work with their objects (which, of course, would be sold at a premium). There’s another virtual tabletop tool in development, and it’s called the Virtual Mat. What separates Virtual Mat from something like MapTool is that it presents the game space in 3D. It accomplishes this by re-using the models and animation from Neverwinter Nights. This means you’ll need to own NWN to use its resources. That being said, the NWN mod community has provided a ton of free resource that could be used. Virtual Mat is written in Java (using the jMonkeyEngine), so it makes the software fairly cross-platform. However, like most virtual table tops, Virtual Mat has no plans to implement actual rules, but it is trying to hook a lot of the animations and models present in NWN along with common virtual tabletop elements like fog-of-view. 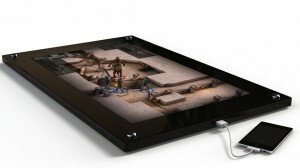 I’m really liking the look of Virtual Mat! Yes, the decision to bootstrap off the the Neverwinter Nights resources is brilliant. I hope the developer keeps at it, it could shape up to be a very cool tool. I also believe the code is open, so anyone could extend (maybe to work with a device like the ePawn…). All very cool, but I still don’t know if it’s going to be replacing my standard game mat any time soon. You know where I see real potential for these? Gaming cafes. 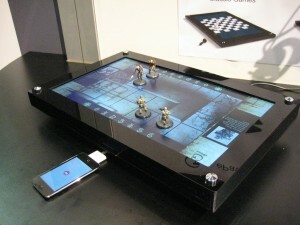 If it makes it to market before the new Amazon Tablet(s), then I might opt for ePawn as my winter electronic purchase.